How could you not get completely caught up in the Christmas spirit when all around you the world is covered in a beautiful coat of snow? When huge pine trees are wearing a white fluffy jacket and you can see the reflection of hundreds of thousands of Christmas lights twinkling… it's enough to convert even the staunchest holiday hater. The further north you go in Scandinavia, the shorter the days are in winter. In the middle of winter, the sun in the most northern parts barely rises above the horizon for two whole months. Even further south, there are only 6 hours of daylight. Light is therefore pretty important in the whole Scandinavian Christmas tradition, it all starts on the 13th of December, when everyone gets up just before sunrise to celebrate the Santa Lucia (literally meaning "holy light") festival. Candles are lit and ginger cookies, saffron rolls and steaming coffee are served for breakfast. Later in the day, there are lots of joyous Santa Lucia parades everywhere. In Scandinavia, the more common Christmas traditions are mixed with age-old remnants from the heathen past - meaning there's quite a lot of Viking symbolism. The most popular Christmas decorations, for example, are little (or not so little) straw goats. These represent the two flying goats that pull the chariot of the Norwegian God of Thunder, Thor. When it's cold outside, a hot drink is the best way to keep warm. 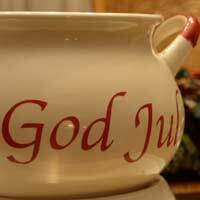 And glögg a type of mulled wine will definitely heat you up: the traditional Scandinavian Christmas drink is a rich blend of red wine, port, cinnamon, cardamom, almonds, oranges and lots of sugar. Just don't drink glögg and ride your reindeer afterwards! Christmas dinners are pretty similar to those served all around the world, with the exception that Scandinavians serve geese instead of turkeys and enjoy marzipan for dessert. If you really want to go all the way and celebrate Christmas the way it used to be celebrated in faraway places in Scandinavia a long time ago, then you have to be willing to get a little uncomfortable: you'll have to sleep on a straw bed with your entire family on Christmas Eve, for example. Doing so will bring you good luck for the next year. And you'd best not get too attached to your Christmas tree either, because you have to chop it up and burn it bit by bit over the course of the holiday season.